My Son Will Celebrate His Birthday With an Inspired Inceptions Personalized Shirt! I can't believe it but my son's three year birthday is coming up in October!!! Where has the time again! It seems only yesterday that I became a first time mother of this beautiful, rambunctious baby boy! This year, he wanted a train/Thomas the Train birthday party so when Amy from Inspired Inceptions reached out to have her Etsy Shop featured, I immediately started searching to see if she had any Thomas birthday shirts for my son to wear at his birthday party! And SHE DID!!! Amy is a full time wife, mom, friend, and crafter. She started her business of making heat press shirts after having her son Nolan. Now she has turned it into a business that she LOVES!! She loves coming up with new ideas and working with customers to create a personalized shirt just for them. If you have an idea for a shirt but don't see it on her site, don't hesitate to ask and I bet she can make it!! And best of all, there is NO extra charge for custom designs! Children's shirts start off $17.99. She can do long sleeves and colored shirts but they are an additional charge. The minute my son saw his super cute Thomas the Train with Birthday Number T-shirt, he was jumping up and down with excitement! I loved that we got to personalize the shirt with his name and 3 for how old he will be at his birthday party! I can't wait to show you all his upcoming birthday pictures with him wearing this super cute shirt! 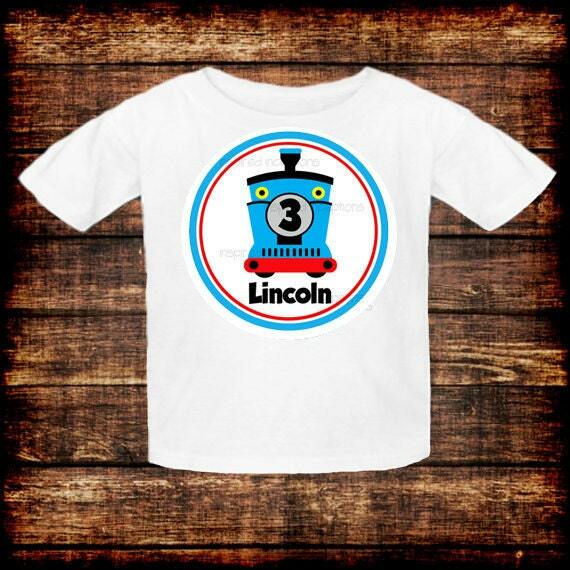 Buy It: You can purchase the Thomas the Tank T-shirt for $17.99 from the Inspired Inceptions Etsy Shop.